Poaching of sea turtles has been taking place for hundreds of years. Even this year, when I was working in turtle research, on the ‘drug trail’ beaches of Costa Rica, it was normal to see an intoxicated poacher walking behind me, armed with a machete and on the lookout for turtles. 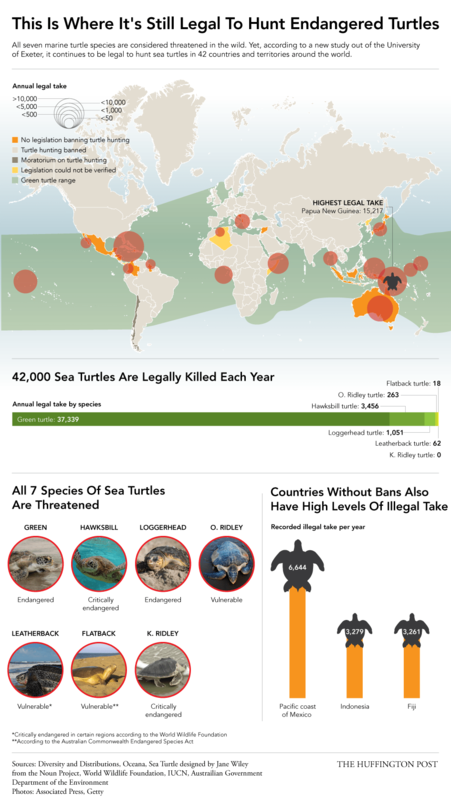 However, sea turtle poaching is far more common than you would think. Sea turtles are a cosmopolitan family of reptiles and as a philopatric group, they only come back to their natal beaches to nest. The International Union for Conservation of Nature (IUCN) categorise these groups into Regional Management Units (RMU’s), finding that six of the seven sea turtle species range from vulnerable to critically endangered. Sea turtles are vulnerable due to their delayed sexual maturity and lengthy generation time, and hence poaching may lower their replacement rate. Turtles have many uses: their oils can be used to treat respiratory issues, the blood is nutritious and the internal organs are used to make soup. In some cultures, the eggs are thought to be an aphrodisiac and are sold in bars for the equivalent of 2 dollars for 4 eggs. ‘Eating turtle meat was like eating chicken…less expensive than the beef meat’. Surprisingly, legal turtle poaching does exist. Humber et al. revealed that in 42 countries and territories, an excess of 42,000 turtles were hunted annually. However, a large portion of this take (74%) was concentrated in just three areas Australia (15.7%), Nicaragua (22.3%) and Papua New Guinea (36.1%). Poaching has become taboo as sea turtles have become endangered. Despite this, the decline of artisanal fisheries risks a disintegration of important cultural rituals. [2, 3] It is hence necessary for conservation not to detract from this identity when trying to protect sea turtle populations. Are sea turtles really threatened? While this validates decades of conservation efforts, it would be incorrect to assume that sea turtles as a family are increasing. Take green sea turtles: the most hunted of all species (> 80% globally) [2, 4] yet many RMU’s are increasing. Sea turtle populations are notoriously difficult to assess due to a lack of recently published data, more than 50% of the time series in Mazaris’ study were not included in the recent IUCN assessments. There are ways of harvesting which boost the conservation of a RMU. Ostional, Costa Rica is a prime example of this. Here olive ridleys (Lepidochelys olivacea) nest in mass synchrony known as an arribada (‘arrival’). 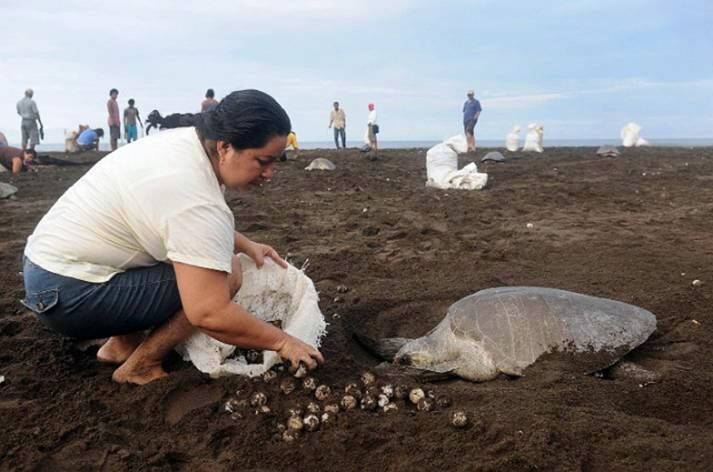 Uncontrolled illegal poaching led to the creation of a female-led management agency to control the harvest and protect the turtles during an arribada, which can be as many as 476, 550 egg-laying females during a three day period. This system allows locals to harvest during the first 2.5 days of an arribada. Harvesting lowers clutch density, and destruction rates by other nesting females, likely contributing to more successful hatching rates, due to less organic matter being in the sand substrate. The harvested eggs are then sold for the same price as chicken eggs, which floods the black market with cheap eggs, whilst still providing a steady flow of capital for the community. Legalized commercial harvest can allow us to track trade routes to where egg demands are greatest. However, despite the positive effect on hatching rates, this population may be exhibiting signs of decline. As a result, even sustainable harvesting may not be a long term solution to poaching. Wildlife farming: a sustainable solution? In the Grand Cayman Islands, in the Caribbean, the Cayman Turtle Farm (CTF) operates as the only legal turtle farm in the world. The CTF was created to meet continual demand for turtle meat, after excessive hunting catalysed the decline of the Cayman green turtle rookery. Considered to be the national dish, approximately 54% of households had consumed turtle meat at least once in the past. Therefore, having an isolated, captive population for the consumptive purpose could allow wild populations to recover. Although the the farm has achieved success, demand remains higher for wild meat.. The study found that most (62%) meat was consumed at a restaurant or a friends house. Consumer preference for wild meat may allow legal fisheries to absorb continued illegal take. Ultimately, we require long term solutions to detect the rate of illegal poaching in order protect sea turtles and provide alternate modes of income for communities. Ongoing research may provide the answers to these questions. Consequently, alternative fishing opportunities must be provided to reduce both poaching and bycatch, two of the biggest threats which sea turtles face. Mazaris AD, Schofield G, Gkazinou C, Almpanidou V, Hays GC. Global sea turtle conservation successes. Sci Adv. 2017 Sep;3(9):e1600730. Mancini A, Senko J, Borquez-Reyes R, Póo JG, Seminoff JA, Koch V. To Poach or Not to Poach an Endangered Species: Elucidating the Economic and Social Drivers Behind Illegal Sea Turtle Hunting in Baja California Sur, Mexico. Hum Ecol. 2011 Dec 1;39(6):743–56. Humber F, Godley BJ, Broderick AC. So excellent a fishe: a global overview of legal marine turtle fisheries. Divers Distrib. 2014 May 1;20(5):579–90. Valverde RA, Orrego CM, Tordoir MT, Gómez FM, Solís DS, Hernández RA, et al. Olive Ridley Mass Nesting Ecology and Egg Harvest at Ostional Beach, Costa Rica. Chelonian Conserv Biol. 2012 Jun 1;11(1):1–11. ← Sounds of the ocean: how do whales learn their songs? Blog I wrote back in October on #seaturtle #poaching!